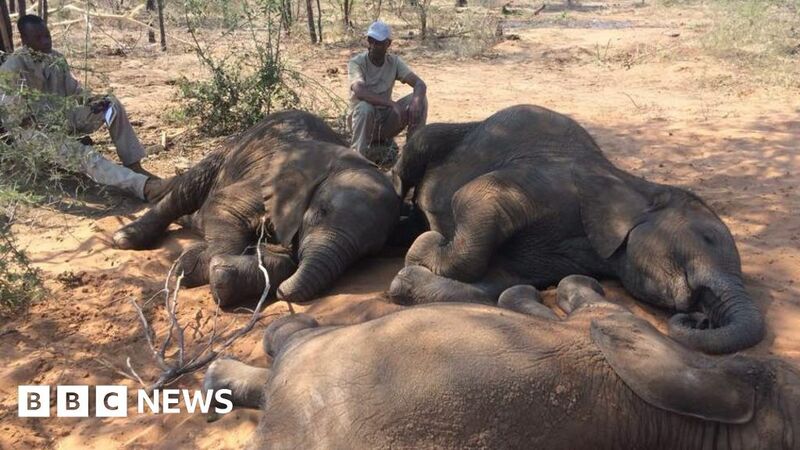 Carcases of nearly 90 elephants have been found near a famous wildlife sanctuary in Botswana, conservationists say. Elephants Without Borders, which is conducting an aerial survey, said the scale of poaching deaths is the largest seen in Africa. The spike coincides with Botswana’s anti-poaching unit being disarmed. Botswana has the world’s largest elephant population, but poachers have been breaching its border. The scientist carrying out the extensive wildlife survey said many of the 87 dead elephants were killed for their tusks just weeks ago – and that five white rhinos have been poached in three months. “I’m shocked, I’m completely astounded. The scale of elephant poaching is by far the largest I’ve seen or read about anywhere in Africa to date,” said Dr Mike Chase from Elephants Without Borders. That census estimated a third of Africa’s elephants had been killed in the last decade and 60% of Tanzania’s elephants had been lost in five years. Botswana has had a reputation for an unforgiving approach to poachers and had largely escaped the elephant losses seen elsewhere. Despite a lack of fences on the international border, data from tracking collars showed elephants retreating from Angola, Namibia and Zambia and deciding to stay within the boundaries of Botswana where it was thought to be safe. Incidents of poaching in the country were rare because of armed and well-managed anti-poaching units. With 130,000 elephants, Botswana has been described as their last sanctuary in Africa as poaching for ivory continues to wipe out herds across the rest of the continent. The first sign that was changing came two years ago when the BBC flew with Mr Chase close to the Namibian border and he discovered a string of elephant carcasses with their tusks removed for the first time. But these latest killings have been found deep into Botswana – close to the protected Okavango Delta wildlife sanctuary, which attracts tourists from around the world. “People did warn us of an impending poaching problem and we thought we were prepared for it,” said Mr Chase, who pointed to the disarmament of the country’s anti-poaching unit as a cause. Botswana’s 2018 Wildlife Aerial Survey is only half-way through and conservationists fear the final figure of poached elephants will be a lot higher. The survey area is split into sections, or transepts, and the plane flies back and forth like a lawnmower cutting the grass – turning at each end to ensure nothing is missed. “Fresh carcasses” are those lost within the last three months, but many of those recorded had been killed within the last few weeks. Conservationists fear the scale of this new poaching problem is being ignored as it is bad for the country’s reputation. “This requires urgent and immediate action by the Botswana government,” said Mr Chase. “Botswana has always been at the forefront of conservation and it will require political will.